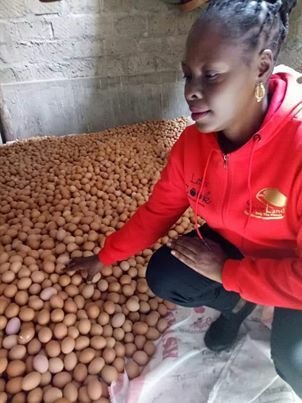 Eggs business in Kenya: A shocking photo that portrays the depths of losses poultry farmers can sink into has emerged online. The photo, apparently, points out a farmer with 2,000 trays of eggs that she has been unable to sell. The farmer who is identified as Jane is reportedly based in Kiserian. Despite high poultry production, she has been left with some 2,000 trays of eggs without a market. The photo also suggests that this farmer can be reached via: +254722512949. Bizna Kenya, though, is yet to verify the authenticity of the photo that has since gone viral. Send your eggs to South Africa! We have very poor quality here now.